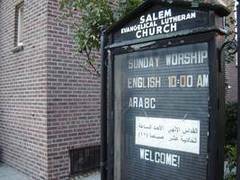 On Saturday, the Living Letters team was welcomed at the Lutheran church in Brooklyn which draws its name from the Arabic word for peace, "Salam". Discussions about gun control and small arms trafficking, violence in the streets and against ethnic groups, as well as the engagement by churches in peacemaking activities consumed the first days of a 10-day visit to the United States by an international ecumenical team representing the World Council of Churches (WCC). Members of the team, who travel to New York, Washington, D.C., Philadelphia and New Orleans from 15-23 September, include a South African church leader once jailed for his anti-apartheid activity, a public health specialist from Lebanon, a Brazilian ecumenical officer and a human rights lawyer from Pakistan. They bring to meetings with American church leaders experiences of violence in their own countries and ways they have been working for peace and justice. The group's visit, called Living Letters, is part of the WCC's Decade to Overcome Violence, an initiative to promote peaceful alternatives to violence. "We need your help," the Rev. Michael Livingston, president of the National Council of Church of Christ (NCCC), told them. Livingston said the country suffers from "a scourge of gun violence": "We need your help to turn around this terrible situation we have." An ordained Presbyterian minister who also is executive director of the International Council of Community Churches in the US, Livingston brought greetings to the delegation on behalf of members of the NCCC which is hosting the visit. "We want to learn from you, and from our own stories, to make this world a world of peace," he said. In the nation's capital, the delegation heard about the grim statistics of epidemic gun violence from Ladd Everitt, representing the Coalition to Stop Gun Violence, and about the activity in arms trafficking from Scott Stedjam, from Oxfam America. "We have a real pride in violence in our country," said Everitt. "We also profit from it," he added, describing how the sale of violent video games and films produced by the motion picture industry glorify violence and promote vigilante justice. "We are a David fighting Goliath," he said, describing the millions of dollars earned by the industry. He asked the ecumenical visitors to encourage Americans to take a stand against the culture of violence. "Our politicians are not speaking up and our community leaders are not speaking up," he said. Stedjam said countries often put profits before principles when it comes to arms sales. The US has sidestepped its own regulations and "has violated the spirit of the law," he said, by providing arms to countries such as Saudi Arabia, despite its record of human rights abuses, to Pakistan, which is ruled by a military dictatorship, and to India, which has refused to sign the non-nuclear proliferation treaty. In another session, delegates engaged in dialogue about the Iraq war with Dr Elizabeth Ferris, a senior fellow with the Brookings Institute, and Dr Antonios Kireopoulos, associate general secretary for International Affairs and Peace of the NCCC. Government representatives also spoke with the delegation during an informal lunch in the Senate building. A tour of Washington's several war monuments from a peace perspective, led by the Rev. Phil Jones of the Church of the Brethren, known historically for its peacemaking, moved members of the delegation. Jones challenged the delegation to speak straightforwardly to the church. "If there are moments we go into narrow spaces, challenge all of us to use a wider lens," he said. "Challenge us to use words that heal, rather than hurt - to ensure a more peaceful world." In the first two days of the team's visit in the New York area, they met with members at Salam Arabic Lutheran Church, a multicultural church in Brooklyn that ministers to immigrants from the Middle East; worshiped at Abyssinian Baptist Church, a historic church serving the African American community in Harlem, and were guests at the third annual Peace Festival of the Fellowship of Reconciliation, an interfaith organization with programs and educational projects that support domestic and international nonviolent alternatives to conflict. Also on the team's agenda are visits with an Amish Mennonite community, where last year five young schoolgirls were killed in a random act of violence; inner-city ministries in Philadelphia where communities are confronting drive-by street shootings; the United Nations in New York on September 21 for an ecumenical event to mark the International Day of Prayer for Peace and New Orleans, which struggles with domestic and street violence in the wake of Hurricane Katrina that broke through levees and flooded two-thirds of that historic city two years ago. The WCC delegation to the US is the second visit of Living Letters, small ecumenical teams who visit a country to listen, learn, share approaches and help to confront challenges in order to overcome violence, promote peace and pray for peace. The first was a team sent 4-14 August to Sri Lanka, a troubled Indian Ocean island that has suffered internal strife since 1983. Renewed violence since 2005 has claimed at least 5,000 lives there. Rev. Edwin Makue of Marshalltown, South Africa, a minister of the Uniting Reformed Church in Southern Africa, is the general secretary of the South African Council of Churches. Lina Moukheiber of Beirut, Lebanon, a member of the Greek Orthodox Church (Patriarchate of Antioch) and a public health specialist who has worked in the United States, the Middle East and Africa, and currently is the director of development at the Saint George Hospital in Lebanon. Dr Marcelo Schneider from Porto Alegre, Brazil, the ecumenical officer of the Evangelical Church of Lutheran Confession in Brazil. He also serves as the ecumenical assistant to the moderator of the World Council of Churches' central committee, Rev. Dr Walter Altmann. Aneeqa Maria Akhtar of Lahore, Pakistan, a Roman Catholic who is a civil rights lawyer and human rights activist. She works as a legal advisor for Legal Aid Assistance and Settlement, along with filling the position of Dean of Faculty and Studies at Trinity Law College in Lahore. "A Living Letters team is successful when those they visit can affirm 'We are not alone!' and when team members feel they have received much from those who they have visited," said the coordinator of the Decade to Overcome Violence, Rev. Hansulrich Gerber, who is accompanying the team to the US. (*) Jerry Hames is a religion journalist who has worked for 40 years for Canadian and American church publications. He recently retired as editor of the national publication of the Episcopal Church in the United States.